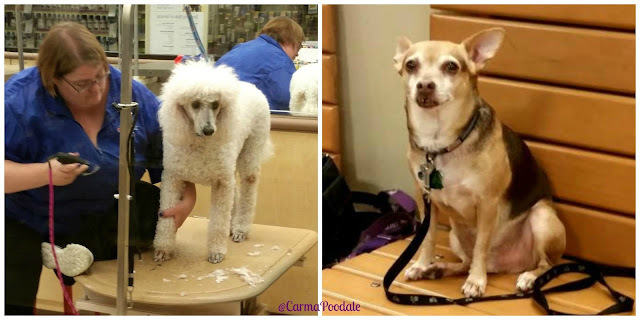 While I was getting a touch up from my favorite groomer, Scooby and ma waited for me. Scooby sat on the bench and looked pitiful because he couldn't go to the groomer too. He had just had a bath and his toenails trimmed by ma so there really wasn't anything that he needed done. Carma is such a pretty name ofr this pretty dog! I love the attention afterwards. BOL! Waiting is boring, I have to agree! Ha! Mr. N would rather skip groomer visits altogether! Carma, when I saw the title of this blog post I thought you were waiting on chickyum. So funny! I bet that you are both beautiful now :) I hope that Scooby realized that everything was going to be okay.